The American Association for the Advancement of Science (AAAS) has named three researchers from the Georgia Institute of Technology as fellows for 2017 for their contributions to the advancement of science. Baratunde Cola, Mary Frank Fox, and Joshua Weitz, who are members of AAAS, were elected by their peers to receive the honor and join hundreds of their contemporaries who became fellows this year. “This year 396 members have been awarded this honor by AAAS because of their scientifically or socially distinguished efforts to advance science or its applications,” the AAAS wrote in its announcement of this year’s fellows. All three Georgia Tech fellows saw the AAAS Fellowship as encouragement to continue serving science and humanity. The three have excelled in research in the following fields, according to AAAS: Cola in nanoscale engineering, Fox in the participation and performance of women and men in science, and Weitz in virus dynamics in populations and in ecosystems. Here are summaries of the researchers’ achievements and interests. Baratunda Cola may be best known for engineering the first-ever optical rectenna. A rectenna, or rectifying antenna, turns electromagnetic waves into direct current electricity, and Cola’s invention was the first known to work with sunlight instead of radio waves, making it an innovation in efficient solar energy generation. 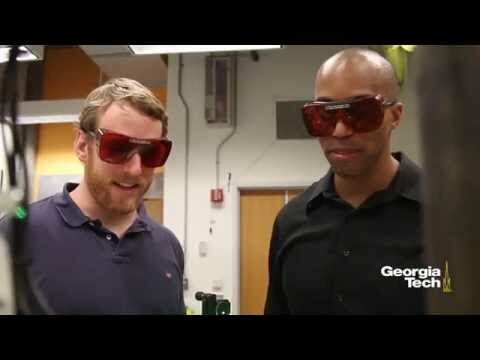 Cola, who is an associate professor in The George W. Woodruff School of Mechanical Engineering at Georgia Tech, is currently focused on the transfer of heat, and the conversion of energy in nanostructures, particularly those based on carbon nanotubes. He holds three carbon nanotube related patents and is interested in making his innovations producible on a large scale for practical use. In April, Cola received the highest honor awarded by the National Science Foundation to up-and-coming scientists and engineers. Like the AAAS Fellowship, the Alan T. Waterman award also recognized Cola’s achievements in transforming light and heat into electricity on the nanoscale, and it added $1 million in funding to his research. Cola also serves as CEO of Carbice Corporation, a Georgia Tech spinoff company that has developed a heat-conducting tape that helps prevent electronic devices from overheating. Mary Frank Fox is known for her research on women and men in scientific organizations and occupations. She is nationally recognized as a leader on issues of diversity, equity, and equity in science, and her work has had a significant influence on science and technology policy. Fox, who is an ADVANCE Professor at the School of Public Policy in Georgia Tech’s Ivan Allen College of Liberal Arts, is particularly interested in how social and organizational settings, in which scientists are educated and work, influence their performance. She holds multiple board of director positions in societies connected to science and technology policy. Fox sees the award as recognition that her work advances science and is aligned with AAAS’s commitments. “I’m one of the founders of this area of science, and I value this award recognizing this research that advances science,” Fox said. Joshua Weitz uses models to predict the effects of viruses on populations and on ecosystems, but his work encompasses many complex biological systems. His group combines methods from physics, math, computational biology, and bioinformatics to develop in-depth analytical models of biological dynamics to understand experimental and environmental data. In the field of virology, he applies this approach to the molecular workings of viruses, their spread through a population and their evolution into new strains. His work is theoretical, but he uses his detailed computational methods to collaborate with experimentalists. Weitz is a professor in Georgia Tech’s School of Biological Sciences, Courtesy Professor of Physics and the Director of the Interdisciplinary Graduate Program in Quantitative Biosciences. “When AAAS first informed me, I was honored and humbled. And I was proud of my group and its collective effort in the last 10 years at Georgia Tech to study viral ecology,” Weitz said. The American Association for the Advancement of Science lays claim to the distinction of being “the world’s largest general scientific society.” AAAS was founded in 1848 and publishes the journal Science as well as many other prestigious research periodicals. The AAAS Fellowship began in 1874.